Some weeks, it’s difficult to decide on a recipe from Latviešu ēdieni. Many of the recipes are very difficult to source affordable ingredients for where we live, primarily herring and other fish dishes. And considering how often herring is used in Latvian cooking, that’s a lot of recipes. Luckily, there are a lot of veggie-heavy salads that we can make for a quick and easy side for our meals. However, this salad very nearly didn’t get made at all, because two of the ingredients required substitution. The first, rutks, is a white radish with a mild flavor. I’ve seen pictures of them, usually at bountiful and overflowing farmer’s market stands in the more veggie-growing friendly states of California and Washington. Here in Utah, however, the markets have been closed for almost a month and even the common red radish wasn’t easy to find even during the season. There was, however, a fairly common white radish variety that I figured I could find at Sunflower, one of our favorite stores that regularly carries all sorts of delicious produce. Daikon. I’d had quite a bit of it thanks to my frequent trips to various sushi and teriyaki joints and knew it was quite mild. (I love Japanese cuisine, but there’s a dearth of it here in Utah sadly.) After describing it to my husband, he agreed it should be a workable substitute. Grate carrot, cucumber and daikon together into a medium bowl. Stir in horseradish and a pinch of salt. Add a spoonful of mayo and two heaping spoonfuls of sour cream. Mix well, adding additional mayo or sour cream1 as needed to pull the salad together. Taste, adjust horseradish2 and salt as needed. As for the sour cream and mayo, as always, I used more sour cream than mayo. I added just enough to bind the veggies into a cohesive, creamy salad. This is another one of those recipes that really depends on the cook’s judgment. My horseradish, prepared at home, is somewhat spicier than store-bought and different people react to horseradish in different ways. You want enough to be felt but not enough to overpower. This entry was posted in latvian, recipes, salad, untranslated, vegetable. Bookmark the permalink. I’ve never tried daikon but with carrots, I may try. Thanks for the recipe. 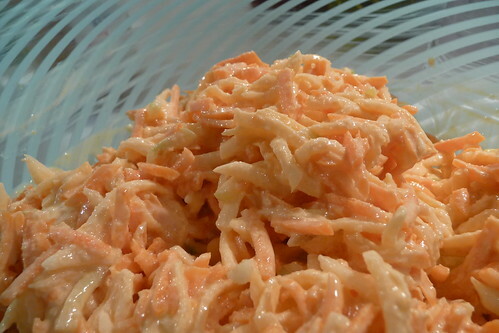 That’s very close to the Latvian version of carrot salad. Delicious! I’m glad you enjoyed it. :) Looking forward to seeing your post about it!